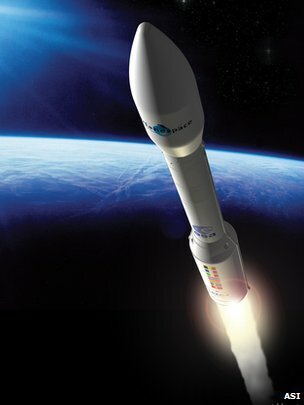 Europe has named Thursday 9 February as the day it intends to launch its new Vega rocket for the very first time. 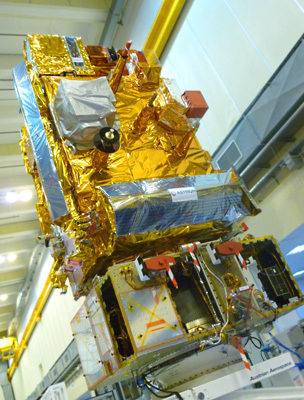 The 30m-tall vehicle has been developed to take payloads up to 1.5 tonnes into a polar orbit, and will fly from the Kourou spaceport in French Guiana. The project has been led by Italian industry and is years behind on its original schedule. But European Space Agency Director General, Jean-Jacques Dordain, said he would not force the pace. “Today, the target date is 9 February, but it’s a target,” he told BBC News. The caution is well advised. Statistics show that some two-thirds of the rockets introduced in the past 20 years have had an unsuccessful first outing. It is for this reason that the satellites carried on the “qualification” flight have been given a free ride. Vega is a four-stage rocket. Its first three segments burn a solid fuel; its fourth and final stage uses liquid propellants, and can be stopped and restarted several times to get a spacecraft into just the right orbit. Esa expects an operational Vega to be launching about twice a year, carrying mostly small scientific and government satellites. If the rocket should need to delay from 9 February to deal with technical issues, it will only be given a short window to resolve the problems before being asked to stand down for several weeks. Vega’s big “brother” at Kourou, the Ariane 5 rocket, is booked to launch Europe’s third ATV cargo ship to the International Space Station (ISS) on 9 March, and this mission will take precedence if there is a conflict. The frequent comings and goings at the orbiting platform require a carefully co-ordinated traffic schedule, and this will not be disrupted for an unrelated, experimental rocket flight. “I have to respect my commitments to my International Space Station partners,” Mr Dordain explained. Vega is just the beginning of what is expected to be a busy year for Esa. Other highlights include the launch of two major weather satellites, Meteosat 10 and Metop-B, and a trio of craft called Swarm that will measure the Earth’s magnetism in unprecedented detail. Policy-wise, 2012 will also be a significant year because it will see the first Ministerial Council since 2008. This gathering of the member states, to take place in Italy in November, will set programmes and budgets for the next three to five years. Key decisions will need to be made on the next evolution of Ariane, on funding for Esa’s participation in the ISS project, and on the development of a next-generation of polar orbiting weather satellites to succeed the Metop series. Nations are likely to go to the meeting in a much weaker position economically than they did in 2008. Nonetheless, Mr Dordain expressed satisfaction with Esa’s current budget profile. The agency will have essentially a flat income this year of 4.02bn euros (£3.32bn), when all contributions, including from the EU, are taken into account). Germany and France continue to be the lead contributors to Esa, although it is noteworthy that the former’s agency contribution now exceeds that of the latter (750m euros from Germany versus 717m euros from France). Italy (350m euros) and the UK (260m euros/£215m) make up the rest of the “big four”.